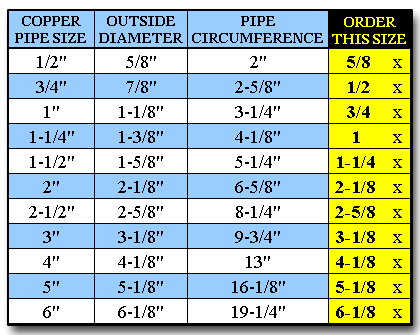 Use the charts listed below to determine what size fiberglass pipe insulation to order. There are two charts each for different types of piping. The Copper Pipe chart is for copper piping only and the Iron Pipe chart is for most non-copper piping (Iron, Black, PVC, CPVC, Sch 40/80 etc). The charts list the pipe size, the outside diameter measurements of the pipe, the circumferences around the pipe, and the size to order. The size to order in the "ORDER THIS SIZE" column is listed with an "x" next to it. Our store lists the pipe size first and then the insulation thickness second. For example 5/8 x 1 fits a 5/8 copper pipe with 1" of insulation. 5/8 x 2 fits a 5/8 copper pipe with 2" of insulation. The E-Z Size Chart for Copper pipes is very important because our online store lists the pipe sizes in Nominal Pipe Sizes which can make ordering Fiberglass Pipe Insulation for copper piping confusing. 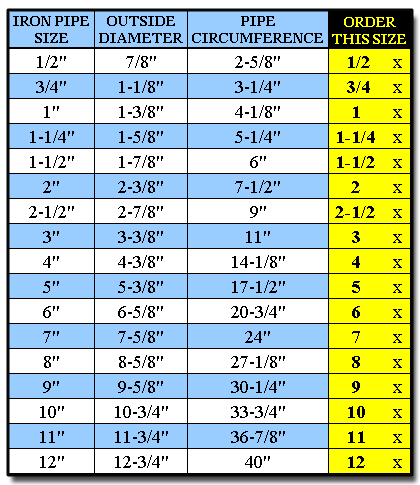 Use the chart above to identify what size pipe you have and order the size highlighted in yellow. 1. Identify what type of pipe you have. For most of our customers this is basically asking if you have a copper pipe or not. If you have a copper pipe use the chart on the Right, if you have a non-copper pipe use the chart of the Left. 2. First look for pipe identification: Copper pipes are usually labeled in ink with the copper pipe size or the outside diameter. For example if your copper pipe says 1" or 1-1/8" OD you would order 3/4 on our site. 2a. PVC and CPVC are almost always labeled in ink with the pipe size which is the size to order on our site. For example if your PVC pipe says 1" you would order 1" on our site. 2a. Iron and Black pipe may have labels if they are newer, but another way to look for the pipe size is at the elbows or fittings. The elbows ususally show the pipe size. If your pipe says 2" you would order 2" on our site. 3. If your pipe has no identification on it, then you have 3 ways to measure. 3a. The easiest way to measure is with a pipe caliper. 3b. You can measure the outside diameter of the pipe. Click here for instructions Once you know the outside diameter of your pipe you can then find the size to order using the charts above. 3c. You can measure the circumference of the pipe. Click here for instructions Once you know the circumference of your pipe you can then find the size to order using the charts above. 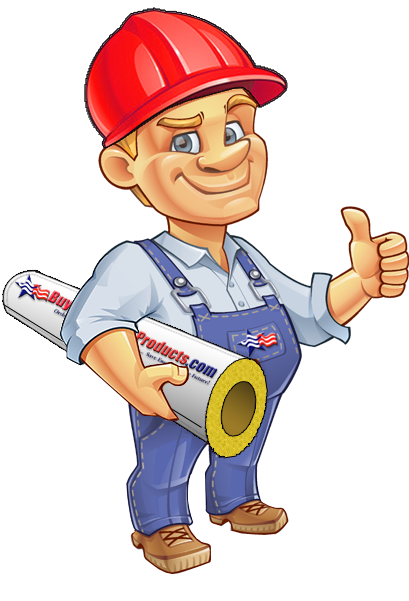 NOTE: If you are unsure of what size Fiberglass Pipe Insulation to order, please feel free to contact us via email, Live Chat, or by Phone.